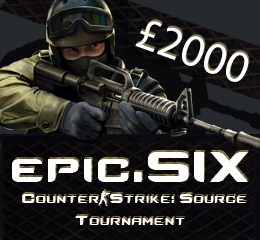 Team signups for the epic.SIX Counter-Strike: Source Tournament are now open. So if you have a pre-arranged team, create the team, hand out the passwords to your team members and get yourselves signed up. If you don't have an organised team, but you want to take part anyway, then sign up as a merc, put a comment in the box about your skill/preferred class and we'll help you to get involved in an existing team or mix team to be in with a chance of winning the prize.